SAN JUAN, Puerto Rico -- Islands at the eastern end of the Caribbean Sea made preparations Sunday for approaching Hurricane Irma, a Category 3 storm that could threaten the area beginning Tuesday. The U.S. National Hurricane Center said the storm could near that region late Tuesday. It said islands farther north, including the U.S. Virgin Islands and Puerto Rico, should monitor the progress of the storm. 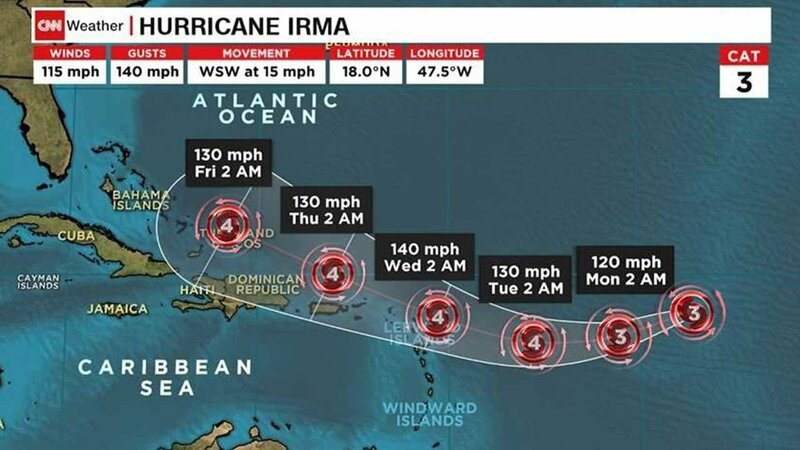 Antigua's prime minister, Gaston Browne, urged people to take preventative measures in case the storm should hit, including cleaning drains and removing objects that could be sent airborne by high winds. Workers began pruning trees and shrubs to reduce chances for branches to tear down power and phone lines. "The passage of a hurricane is not a matter to be taken lightly, but we must not panic," Browne said in a statement. The U.S. hurricane center said Irma had maximum sustained winds of 115 mph (185 kph) and some strengthening was expected over the next two days. The storm was centered about 760 miles (1,220 kilometers) east of the Leeward Islands and moving westward at 14 mph (22 kph). Puerto Rico's governor, Ricard Rossello, said government agencies in the U.S. territory were prepared to deal with any emergencies caused by the storm. "We have established protocols for the safety of all," he said at a news conference, while he also urged islanders to take precautions.